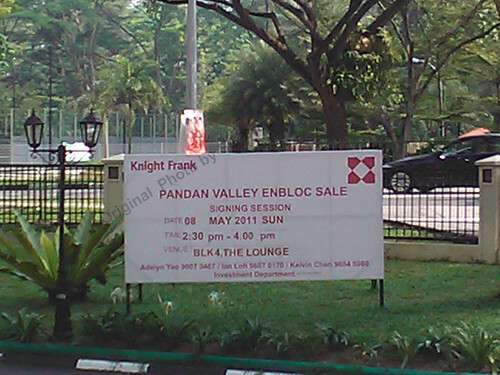 We passed by Pandan Valley today and saw the signboard... again. This must be the third or fourth time over the past two months that they are trying to collect signatures. Well, here's wishing them luck anyway! 4 comments to ''Don't try, don't know... right?" PG (old leasehold) didn't get through. What is Knight Frank thinking? Will the residents incur a fee that is payable to Knight Frank irrespective of whether the en bloc goes through? Or is it a "success" fee? Anonymous (4/5/11, 1:32PM): We believe any fee to the marketing agent is only payable upon successful completion of the en bloc sale. However, we are not absolutely sure about this so maybe someone out there who is better informed can confirm? Why is Astor Green PSF lower than Cavendish Park's PSF? Can enlighten? Anonymous (5/5/11, 3:39PM): A quick check on the caveats lodged in 2011 does indicate that units in Astor Green (AG) were transacted at prices below $930psf, while those in Cavendish Park (CP) were transacted at above $960psf. 1. CP (TOP: 1996) is slightly newer than AG (TOP: 1995). 2. The land area of CP seems to be bigger than AG. Having said that, CP (254) also has more units than AG (170). 3. Although the two devlopments are practically next to each other, we feel the location of CP is slightly better than AG. The apartments in CP are located further away from the main roads (Pandan Valley/Mt. Sinai). However, this may just be our preference speaking. 4. AG has slightly bigger units compared to CP. This may account for the slightly lower PSF.